1. Melt the butter in a frying pan and cook the celery, carrots and Onions. 2. Pour in the flour and mix well. 3. Add milk and chicken stock alternately in small amounts, bring to a boil and stir until thickened. 4. Add chicken, peas, salt and pepper and mix well. Turn off the heat and cool. 5. 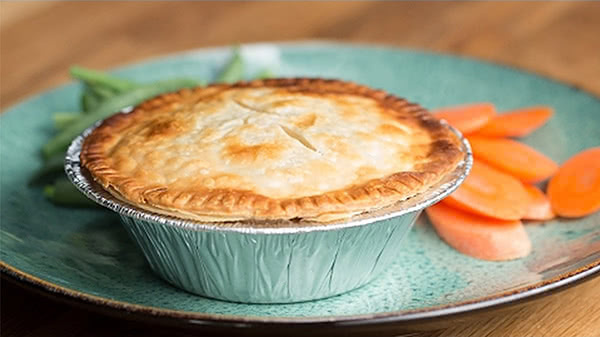 Roll out the pie dough and use the aluminum foil pie pan as a model. Cut out a circular pie crust about 1 inch larger than the top of the pie pan and a pie crust of the same size. 6. Place large pieces of pie crust in the bottom of the foil baking pan and fill with the cooked chicken filling. Cover the top with small pieces of pie crust and pinch the edges. 7. Cover each pie with aluminum foil paper and refrigerate for up to 2 months. 8. To bake, removed from a refrigerator to preheat the oven to 200 ℃, bake for 30 minutes, then remove the top of the aluminum foil and bake for 30 minutes or until golden brown surface.